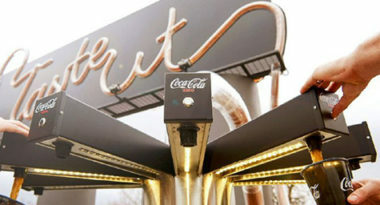 Coke Zero created plenty of hoopla during the NCAA Final Four basketball frenzy with its refreshing drinkable billboard. The billboard appeared at the March Madness Music Festival in Indianapolis’s White River State Park in April. TheDrum.com posted more on Coke Zero’s cool outdoor advertising concept. The 26-by-36 foot drinkable billboard equaled the height of approximately two-and-a-half basketball hoops and weighed 23,000 pounds. It was created by Ogilvy & Mather New York, in collaboration with IMG LIVE and Specialized Mobile Exhibits. At first glance, the black billboard simply looked cool by spelling out “Taste It” through what appeared to be a clear straw coming out of a huge contoured bottle of Coke Zero. But the billboard really picked up points with the basketball fans by dispensing actual Coke Zero directly out of that enormous bottle. The beverage traveled through 4,500 feet of clear straw that spelled out “Taste It” before arriving at a free sampling station on the ground below. Then, fans were treated to a taste of a cold drink from some cool signage. With this eye-popping billboard that wowed the crowd while it quenched the thirsts of basketball buffs, Coke Zero stood above the competition to net a slam dunk during March Madness. Discover creative strategies for outdoor advertising. Contact MDG Advertising.